“We don’t have to do this!” That was our mutual reassurance on the eve of our trip, as we hadn’t read the fine print in the description of the Loch Ossian Youth Hostel before booking online and paying the deposit. As we noticed only after pressing the “confirm” button, Loch Ossian is an “eco hostel”, which in this case meant that it had outdoor composting toilets, no shower facilities, and you had to boil the water before drinking it. After reading this, our imaginations were running wild and we were more than a bit unsettled. Camping is fun when you’re young, but when you start to turn into a stiff and creaky-boned old lady, you’d really rather just be warm and comfortable, especially when you sleep or have to go pee. Neither of us knew exactly what the “composting toilet” would entail and so we looked for examples on the internet, which only made us more nervous. Would it mean we’d have to shovel our own poo and cover it with sawdust? Alas, we rose at the sound of the alarm at 3:30 a.m. the next morning and resolved to just be brave and go for it, poo-shoveling or no. Loch Ossian is a three hour train ride from Glasgow and is reached via Corrour Station, the most remote railway station in the U.K. The station gained a bit fame as it was featured in a scene from the film Trainspotting. Precisely as is depicted in the movie, stepping off the train is nothing short of surreal. As the train departs, you find you’re left alone in the middle of nowhere. Corrour Station was built in 1894 to help the rich Victorian folk get far, far away to a place where they could be all alone in the wilderness and go shoot some innocent deer. The hunting lodge still exists and is now pretty fancy and modernized, though it was eerily vacant during our visit. We meandered through some gates and photographed the lovely building and grounds… and remarked that we might like to splurge just a bit more the next time we visit Loch Ossian and stay at the lodge instead. Imagine – nice showers and toilets! Part of our preparations for this trip included diligent consumer research into what would be the best insect repellant and thank goodness we did, because it really ended up being critical! For foreigners who may not know, the Scottish Highland summers are famous for unrelenting swarms of tiny, sinister, blood-sucking flies, called midges. We read up on the best repellants that would keep them at bay, but not kill us and the rest of the ecosystem in the process. We decided to go with Smidge, as it was Deet-free and therefore relatively safe, and was specifically designed for midges. As we discovered, Smidge smells quite pleasant, too. Our defenses were further fortified with some fine-meshed midge nets to cover our susceptible heads and the tender skin behind our ears, the favorite targets for midges. In the end, both the midge spray and the nets proved an absolute necessity! Terrain: Rough gravel trail along the south, mostly level. Smoother and wider gravel access road along the north, some hills. Time it took us: About 3 hours, with lots of stopping for photographs and wandering around Corrour Lodge. Our first bike venture was a counterclockwise loop around Loch Ossian. The weather was brilliant and there was absolutely no wind, which meant the surface of the lake was still and provided dreamlike, mirror reflections of the pretty, pine-covered islands, surrounding green mountains, and perfect blue sky dotted with puffy white clouds. The narrow path around the south side of the loch is only slightly hilly in parts, but quite rough. There were lots of large, loose round stones to avoid while cycling and some big puddles as well, a few of them quite deep and treacherous. The path smoothed out toward the far end of the loch near the hunting lodge, and the wider dirt road along the north part of the loch returning back to the hostel was much easier to cycle, as it’s a much smoother access road used by the lodge. The hostel experience wasn’t all that we feared. As it turned out, a composting toilet was like an outhouse with the toilet bowl leading to an unknown deep, dark abyss below. It was a tad bit smelly and there were big horse flies buzzing all around… and it was a bit scary, especially venturing there at night, but at least we didn’t have to shovel anything. The hostel attendant was a really nice lady and was really welcoming and helpful and left meticulously hand-written, detailed weather reports on a sheet of paper on the kitchen table each morning. If only the BBC weather reports were as detailed and accurate. Time it took us: About 4 hours, including photo taking time. It rained hard overnight, but luckily didn’t rain at all during the day, though our second day was a bit overcast. On the second day we rode along the north road again to the hunting lodge and continued beyond along another dirt road up into the hills and later returned to the station to head back home to Glasgow. We’d love to go back to Corrour and Loch Ossian again sometime, maybe in the winter when it’s midge-free. It must be magically beautiful when the loch is frozen and the hills are covered in snow! It’s an amazingly remote and beautiful place. The tranquility was only briefly interrupted by someone eerily practicing either a flute or a recorder (we couldn’t tell), somewhere up in the hills… and someone else practicing their, uh, I guess you’d call it singing – in the hostel. Overnight our dorm room was packed full with eight women, two of whom came crashing and clamoring to bed late at night, shining their head torches in everyone’s eyes and making a ruckus rummaging through their bags, zipping and unzipping noisy zippers, before finally falling asleep and snoring as loud as chainsaws. Our posh eco youth hostel offered earplugs. Thank goodness! 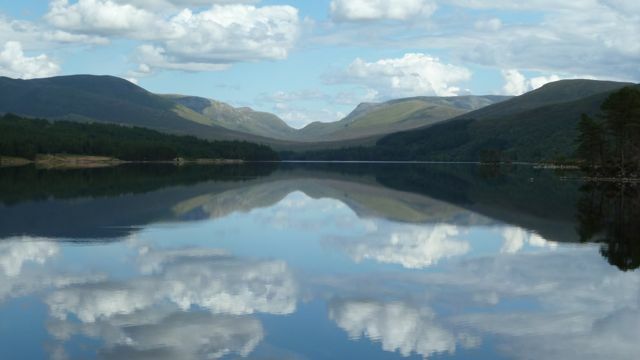 How to get there: 3 hours from Glasgow (train from Glasgow Queen Street to Corrour Station). Anytime return ticket was £36.40.